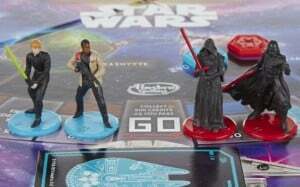 New Star Wars Monopoly Has No Female Characters | Nerd Much? There’s a Monopoly game for just about every major franchise, and that includes Star Wars, of course. Now, there’s an updated Star Wars Monopoly that has just been released by Hasbro, just in time for The Force Awakens, one of the most anticipated movies of 2015 (and, certainly our most anticipated film this year). But, there’s a problem: there are no playable female characters from the Star Wars universe. Unfortunately, the new Star Wars Monopoly only includes four character choices: Darth Vader, Kylo Ren, Luke Skywalker, and Finn (which is John Boyega’s character). There are no Princess Leias, Padmés, Captain Phasmas, or Rey Solos to be found, which is a surprising design choice by Hasbro, given the fact that those are such important characters to the franchise (with Captain Phasma and Rey Solo supposedly having major roles in Episode VII. Otherwise, the game challenges you to dominate the universe, but instead of Boardwalk, St. James and St. Charles Place, you’ll trade Coruscant, Endor and Tattooine. Instead of Federal Tax, you’ll pay Trade Federation Tax. The board is also circular, not square (which, let’s be honest, makes much more sense, anyway). The game also has Force cards, which change your destiny as you play. While it’s certainly a colorful and cool-looking board game, it would have been nice to have included some of these prominent female characters.